On June 9th I went to Chicago, IL to run in a half-marathon with my brother and girlfriend. Prior to this I had never ran more than 6 miles at once and had spent my time playing sports and lifting weights as opposed to endurance training. 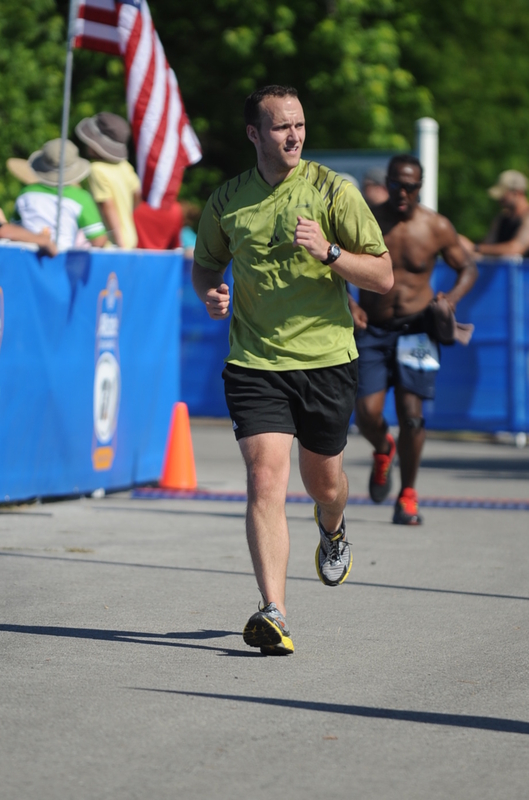 I trained for 3 months, ran the half-marathon, and learned a lot about myself and running. The 10% rule implies that you should never increase your duration, frequency, or intensity by more than 10% per week. The only time I had pain during my training was after I violated this rule. It was early in the training when I went from running 3 miles, 3 times a week to all of a sudden doing 3 consecutive 3 mile runs. I was feeling great, getting addicted to the gratification, and feeling overly ambitious. I went from 9 miles in a week to 9 miles in 3 days. I strained my left calf and had to spend a lot of time managing the injury early on. I quickly learned that running 3 times a week (non-consecutively) and progressing by 10% per week is more than enough. It helps that I’m a physical therapist and I see injured runners everyday. So I knew what the common injuries were and how to prevent them. More importantly, I also knew what my own impairments were. I had tight hip flexors and calfs and a tendency to overuse my hamstrings over my gluts. Knowing this helped me to focus on resolving this impairments early on and afforded me a more efficient running gait. Any time I had some soreness or if a run was difficult, I would just put some extra time into my personal impairments and the next session would be much easier. I see alot of injured runners in the clinic who only run during their training. They don’t stretch, they don’t strengthen, they only run. Repetitively working the same muscles in the same manner in only one plane of motion is a formula for failure. It’s important to supplement your endurance training with stretching and strengthening. I designed my workouts to help me run more efficiently and to prevent injuries. I included alot of stretching and mobility exercises, balance training, and hip and core strengthening. This gave me more stability and prevented compensatory motion. It also allowed me to strength train without impacting my run the next day due to soreness. Prior to this half-marathon I always though the goo packs and running with water around your waist was for lunatics who live, eat, and sleep in their running shoes. This quickly changed after I started running over an hour. I distinctly remember a 11 mile run that lasted about 1:40. I had no food and no water. The last few miles were hell. I had nothing in the tank. Every step was difficult. I felt nauseous. I had hit “the wall”. It took me a full day to recover from this session. The next run I took one of those disgusting goo packs (never take vanilla) at 55 minutes and the rest of my run was much easier. There is a big correlation between nutrition and physical performance. Many people told me to start out slow, run negative splits, and to wait for my legs to get under me. However, when the race started and the adrenaline hit things changed. I started to be concerned about separating from “the pack” and passing people that didn’t look like they trained appropriately. At the 4 mile mark I was running a minute faster pace than I had during my runs while training. I dialed it back and tried to settle in to a good rhythm, but the last few mile markers seemed much longer than the first few. A couple of the people I was passing in the beginning came back around to pass me during the last few miles. My advice would be the same as all the people I mentioned in the beginning – start slow, run negative splits, and wait for your legs to warm up. I just hope you listen better than I did. I had muscle soreness and some ITB pain after the race. After stretching, foam rolling, a 2 hour nap, and going for a short leisure walk I was feeling fine and ready for the celebration to begin. At the end of the day I did the same thing…after several celebratory beers. I woke up on Sunday without any problems.